I’ve been turning this Will Smith quote over in my head for weeks now. Noticing how I let fear stop me from initiating projects I’d really love to push “go” on. Or how I often get excited by an idea, then say to myself, “Hmm, I don’t know, maybe not,” all because in the back of my mind is that negating caution to be realistic. What if, instead, we gave ourselves permission to be wildly impractical? To throw caution to the wind during our creative process/brainstorming/visioning? How many deeply meaningful and creatively expansive projects would we undertake if the pervasive message was to be outlandish, outrageous, and a little loony, at least every now and then? With that in mind, I rounded up a few articles I’ve had the pleasure of reading lately that illustrate the benefits of taking the road less traveled. 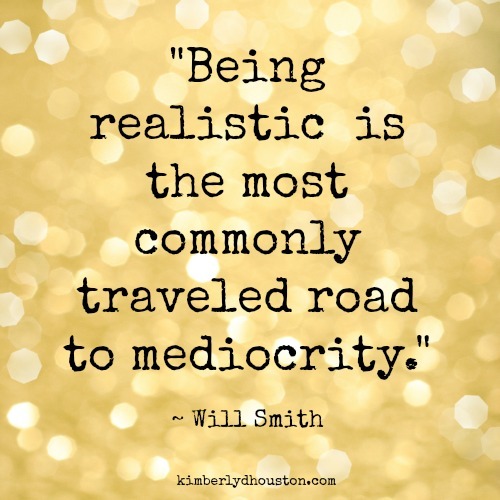 Of being unrealistic. Whether it’s in your marketing, your creative work, or through simply declaring you are the thing you most want to be – artist, writer, photographer, designer, what-have-you – being open to the unconventional can open up a whole new world of possibilities, leading to success breakthroughs you didn’t even know you were capable of. These articles each illustrate in their own way that success doesn’t always come from following the default operating paradigm to be realistic. And thank goodness for that. Read more here about the power of taking an unconventional approach to a creative project. This group of go-getters didn’t let challenging obstacles or the dreamslayers and naysayers of the world keep them from following their dreams and achieving success. Check out these four tales of unlikely success here. The title of this article sums it up: road less traveled. And we love “road less traveled” around here. Here are 19 secrets from 19 lifestyle businesses that found success by stepping off the beaten path and doing something different. In this article Erika Napoletano writes about one of my favorite topics – how to stand out in a saturated market by being your straight-up self. These branding lessons from 8 “bold, brash and brazen” companies prove that building a successful and well-loved business around unique personality factors can have you smiling all the way to the bank. Read about how these companies brought personality into the branding mix to transform what could have been deadly dull and boring into compelling and drool-worthy here. Here’s the story of how Brenton Hayden, Harvard Business School and MIT Sloan School of Business graduate and CEO and founder of Renter’s Warehouse USA, made $966,803 in his first full year of business and eventually became a retired multi-millionaire just after his 27th birthday – after being fired and evicted. Proof that opportunity exists in every situation. Read about Brenton’s path to success here. Read Goin’s story about how he declared himself a writer, ultimately achieved success, and created a thriving career doing what he loves here. And there ya have it. I hope you found some inspiration and motivation in these tales of others who found success by doing things differently. Now it’s your turn – in the comments below, tell me about a time you took the road less traveled (in your business or personal life) despite well-meaning advice from family and friends, and what the happy result was. I’ve been on the road less traveled for most of my life, in some way or another. These days, I’m running my own business as an intuitive artist and advocate for self-expression. I’m going off the path by doing things my way instead of the “standard” artist statement and portfolio, being very open about my life, inspiration, and motivation. My images are more than pretty to look at. They can help the owner focus on what they need to work on, remind them to be themselves, and help them overcome challenges. I too have been on the road less traveled in my work and career most of my life. I’m glad I’m not the only one who chose to do things differently.